I shared with you my Tomatillo and Poblano Salsa Verde recipe yesterday. 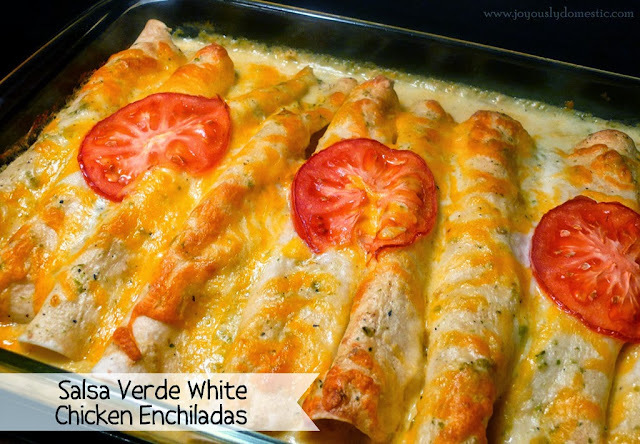 I've been dying to use it in the cream sauce of chicken enchiladas. Let me share with you just how amazing it was! I've made a lot of versions of enchiladas throughout the years. I think this one "took the cake." I've made this type of cream sauce with canned green chiles before, but this version using my homemade green salsa is beyond anything that I've made like this in the past. To say that I am in love with these enchiladas is quite the understatement. These babies will knock your socks off. (Or, your flip flops if your weather has heated up like mine and socks have been tucked away for the summer). My sister, her sweetie and my little nephew came for dinner. We scarfed down these enchiladas with total abandonment. I served shredded lettuce, diced avocado, lime wedges, tomatoes, red onion slices, black olives, sour cream and extra Tomatillo and Poblano Salsa Verde on the side to be used as toppings. We barely touched the accompaniments ... the enchiladas were to die for all on their own! If you're not up for making the homemade version of the salsa, a store-bought green salsa will work. But, I promise you that going the extra mile to make it homemade is beyond worth it. The salsa can be made (and is even better) 1 - 3 days in advance. Heat up the olive oil in a large sauce pan over medium heat. Cook onions and garlic until just softened. Add in the cumin, paprika and chili powder. Stir to coat. Remove onions and garlic from pan to cool. Wipe out pan with a paper towel. Return pan to heat. Melt the butter, then sprinkle in the flour. Whisk occasionally while cooking 3 - 4 minutes. Pour in chicken stock. Whisk to combine. Simmer until sauce begins to thicken. Turn off heat. Add in the sour cream and green salsa. Stir to combine. Season with black pepper. Set aside. In a medium bowl, combine the cooled onion/garlic mixture with the shredded chicken and 3 cups of shredded cheese. Coat a very large rectangular baking dish with non-stick spray. Set aside. Place a couple of large spoonfuls of the chicken filling mixture onto each tortilla. Roll up tightly and place each tortilla roll seam-side down in the baking dish until you've completed all ten enchiladas. Pour the white sauce over the tortillas. Top with the additional 1 cup of cheese. Top with thin-sliced tomatoes (optional). Bake for about 30 minutes ... or until everything is bubbly and beginning to brown. This sounds absolutely scrumptious!! I'm going to make it really soon! Wish there was a pin it button for pinterest! outstanding enchiladas - I made it exactly as written. Tasty!!! This is one of my favorite meals!! So good! I agree this is a great recipe as written! It is one of my favorite go too's! I like the ease of the recipe so I have always gone for the store bought salsa verde - i really like the safeway brand! and always add the tomatoes to the top. YUM!